1836 Robert was born in New Shildon (aka East Thickley), County Durham, England. 1841 Census. Shows him at home age 6 with his parents, and his father William listed as an Engine-driver. His siblings Margaret and George were not at home but found in Hutton Rudby, N.Yorks at the home of James Flounders a retired farmer. Mr Flounders was a cousin of Benjamin Flounders of Yarm one of the wealthy promoters of the S&DR. 1851 Census. Aged 15 he was living with his parents in Shildon and listed as an engine-fitter. He would have been an apprentice under the regime of Mr William Bouch who took over the role of Locomotive Superindentent at Shildon following the death of Timothy Hackworth. 1857 June 21. Aged 21 Robert married Ann Adamson Dent neice of Daniel Adamson. Some time later Mr Adamson became promoter and first chairman of the Manchester Ship Canal. On the marriage certificate Robert's father is shown as an Engine-driver. 1861 Census. Aged 24 Robert and his young family had migrated to the railway town of Doncaster. He was later head-hunted by boilemaker Daniel Adamson to work for him at his Newton Moor Iron Works in Ashton, nr Hyde, Stockport. 1865 April 11. His daughter Lavinia was born at 'Rose Mount' which was a cottage in the grounds of the above iron-works. 1871 Census. He was living at 41 Birch Street, Gorton, Manchester listed as an engine erector. 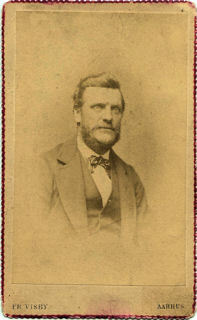 He is known to have worked at the nearby Beyer-Peacock locomotive works, but moved on from there together with his wife Ann (Adamson) and seven daughters to reside in Westgate, Newcastle-upon-Tyne. His eighth daughter, my grandmother was born there in 1876 (see below). 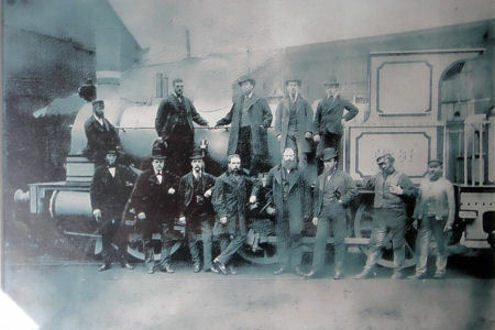 however, I believe the photograph was taken in Shildon, Co.Durham. HFM Visby's pen and ink autograph is on the back of the card. A click on the picture will take you to the Party; and more about photographer Fred Visby. which was behind Soho cottage, now known as Hackworth House, Shildon. Also present, Mr William Bouch and men in smart attire thought to be Vikings. The engine (DGR no.61) was destined for the lines of the Danish Government Railways. 1876 February 6. Robert's daughter Helena (my grandmother) was born at 92 Stanhope Street, Westgate, Newcastle-on-Tyne. At the time of writing, I guess that Robert was working at the Forth Street works of R & W Hawthorn Ltd.
1881 Census. The family had returned to Birch Street, Gorton, Manchester but to a different house, i.e. no.49 not 41. 1925 Q4, Robert died age 89 in South Manchester ( Ancestry.co.uk / Taylor Family Tree / AuntieChicken60 ) w.i.p. 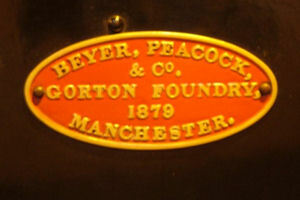 This plate dated 1879 was seen on an engine at the Locomotion Museum, Shildon in June 2007. Dr James Hutton 1726 - 1797, hence "Huttonian". In the name of simplicity data sources are in general omitted. However please feel free to inquire.